Diving to depths beyond 45 m incurs a high level of gas density and nitrogen narcosis; and diving with Trimix (a combination of helium, oxygen and nitrogen) rather than air helps divers avoid this. On this course, divers learn to plan and execute decompression dives using normoxic trimix (18-21% oxygen content) to a maximum depth of 60 m.
This is taking your decompression diving to a whole new level and apart from discovering the benefits of Trimix diving, you will also learn to plan and execute dives using two different decompression gases. 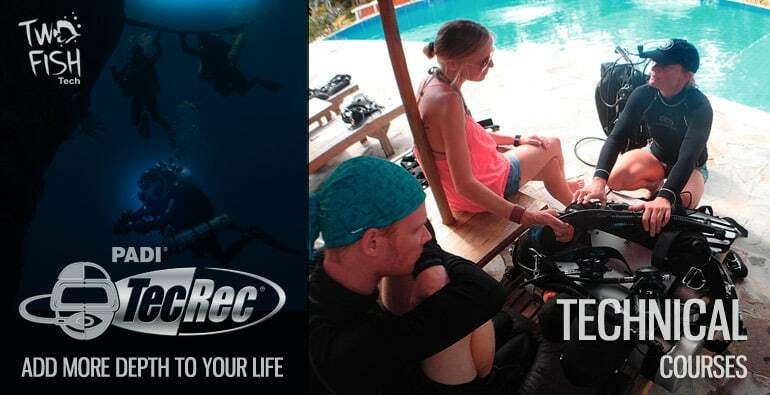 The TDI Trimix Diver course is open to students after their Decompression Procedures (or PADI Tec45) course, assuming they have at least 100 logged dives. Advanced Trimix teaches diver how to conduct dives using custom Trimix, travel gases and decompression gases to a maximum depth of 100 m.
The course trains you to plan and conduct staged decompression dives to a maximum of 100m using custom Trimixes and a range of decompression gases. You will also learn how to handle more than two stage / decompression tanks and build up your depth gradually.